ISLAMABAD: Jamaat-e-Islami (JI) Pakistan leader Senator Sirajul Haq has called upon the Punjab government to hold an independent enquiry into the recent clash between two students groups at the Punjab University and arrest the elements involved in unlawful activities in order to restore peace at the campus. Talking to media outside the parliament house on Friday, he said that the IJT programme for the new entrants was sabotaged and the stage was pulled down. He said that instead of punishing those responsible, the varsity authorities and the government had arrested the IJT workers and detained hundreds of them. Sirajul Haq said that many outsiders detained by the police from different spots had admitted that they had been called to sabotage the Jamiat programme. He also said that certain elements were exploiting the students in the name of Balochistan. He pointed out the IJT had set up free tuition centres for the Baloch students where they had received best facilities and were now working on imports posts in national institutions. Meanwhile, the acting German Ambassador in Islamabad Jens Jokisch called on the JI chief at the parliament house. Talking to the envoy, Sirajul Haq urged Germany to play an active part in the solution of the Kashmir issue through the grant of the right of self-determination to the Kashmiris. The JI chief noted that both Pakistan and India were nuclear powers and the world at large would continue to face a threat of nuclear war till the Kashmir issue was resolved. He said that it is in the interest of the people of Pakistan and India to find out a solution to the Kashmir issue at the earliest. 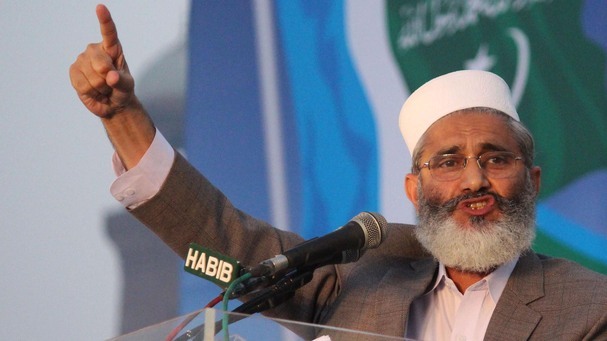 Sirajul Haq said that around five million Muslims were living in Germany of which 50,000 were Pakistanis. He said that the Pakistani nation wanted strong relations with Germany. The JI chief expressed his gratitude to the German government and people for hosting Syrian refugees.